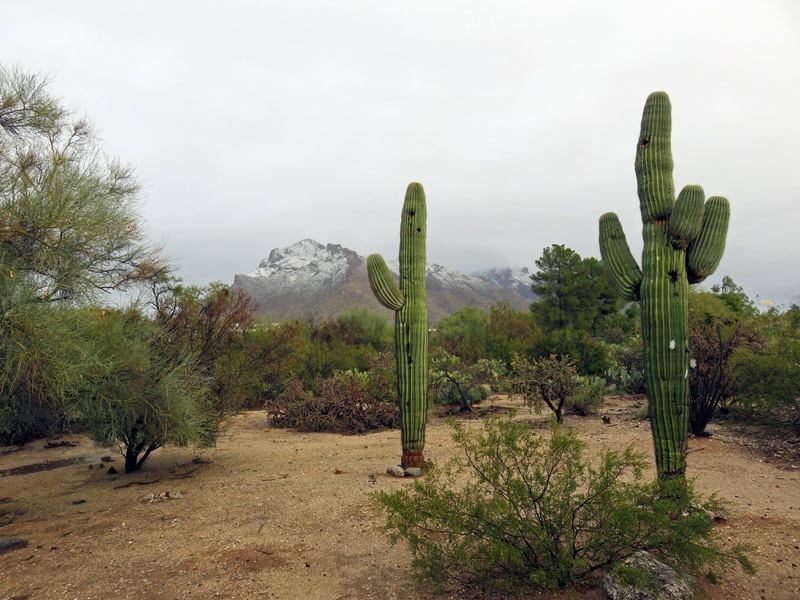 Last January, on New Year's Day, we had snow in Tucson. Today when I went to pick up my nephews from school, we had more. Early this morning as I headed to my doctor appointment, it was chilly but clear. Two hours later the storm clouds were covering the city and the rain had started. By 2:30 when I went to pick up my youngest nephew, the rain was coming down hard and the roads were flooding, as they're known to do here when we get a quick heavy rain. By 3:00 the washes were running freely and I was actually a little concerned about how deep the water was getting and how fast it was flowing. The roads looked like our yard did a couple of years ago. Then, less than a mile from our house as I pulled up to the high school, the snow was falling in big fat wet flakes. It didn't stick, but the roads a few miles north of us were a mess. I was home from the school within the next fifteen minutes and the photo above was the view from the front yard - heavy, low clouds, and snow on the mountain. The Weather Gods knew I was coming. I checked out your 2014 video of the running water in the yard, following an earlier storm. Intense. Gonna be interesting to hear about what else you see, out on your travels in this year of El Nino.